Interactivity as a way to help users understand and/or explore complex information issues has been utilized successfully in information science areas such as information retrieval. 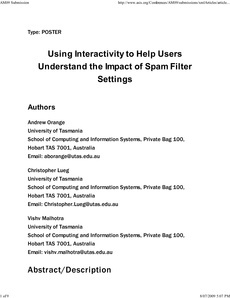 In this paper we report experiences with utilizing interactivity in a different albeit related context: informing users about spam filtering processes. Spam filters that prevent spam from showing up in inboxes by filtering incoming messages according to their suspected level of "spamminess" are readily available. However, the complexity of modern spam filters aggregating evidence from various sources means few non-expert users of spam filters actually understand what their spam filters are doing. It also remains unclear how different spam filter settings would impact on what they see in their email inboxes. In this paper, we describe work into using interactive exploration as a way to increase users' understanding of how spam filters work. Lab-based evaluation of a prototype suggests a considerable increase in spam filtering understanding occurred even among subjects that stated they had prior spam filtering expertise.